The record is made up of 2 volumes (1624 pages). It was created in 1915. It was written in English. The original is part of the British Library: India Office The department of the British Government to which the Government of India reported between 1858 and 1947. The successor to the Court of Directors. Records and Private Papers. Theses two volumes make up Volume I, Part IA and Part IB (Historical) (pages i-778 and 779-1624) of the Gazetteer of the Persian Gulf Historically used by the British to refer to the sea area between the Arabian Peninsula and Iran. Often referred to as The Gulf or the Arabian Gulf. , ’Omān and Central Arabia (Government of India: 1915), compiled by John Gordon Lorimer and completed for press by Captain L Birdwood. Part 1A contains an 'Introduction' (pages i-iii) written by Birdwood in Simla, dated 10 October 1914. There is also a 'Table of Chapters, Annexures, Appendices and Genealogical Tables' (page v-viii) and 'Detailed Table of Contents' (pages ix-cxxx), both of which cover all volumes and parts of the Gazetteer . 'Chapter IX. History of Turkish ’Iraq' (Part 1B, pages 1179-1624). Volume I, Part I has been divided into two bound volumes (1A and 1B) for ease of binding. Part 1A contains an 'Introduction', 'Table of Chapters, Annexures, Appendices and Genealogical Trees' and 'Detailed Table of Contents'. The content is arranged into nine chapters, with accompanying annexures, that relate to specific geographic regions in the Persian Gulf Historically used by the British to refer to the sea area between the Arabian Peninsula and Iran. Often referred to as The Gulf or the Arabian Gulf. . The chapters are sub-divided into numbered periods according, for example, to the reign of a ruler or regime of a Viceroy, or are arbitrarily based on outstanding land-marks in the history of the region. Each period has been sub-divided into subject headings, each of which has been lettered. The annexures focus on a specific place or historical event. Further subject headings also appear in the right and left margins of the page. 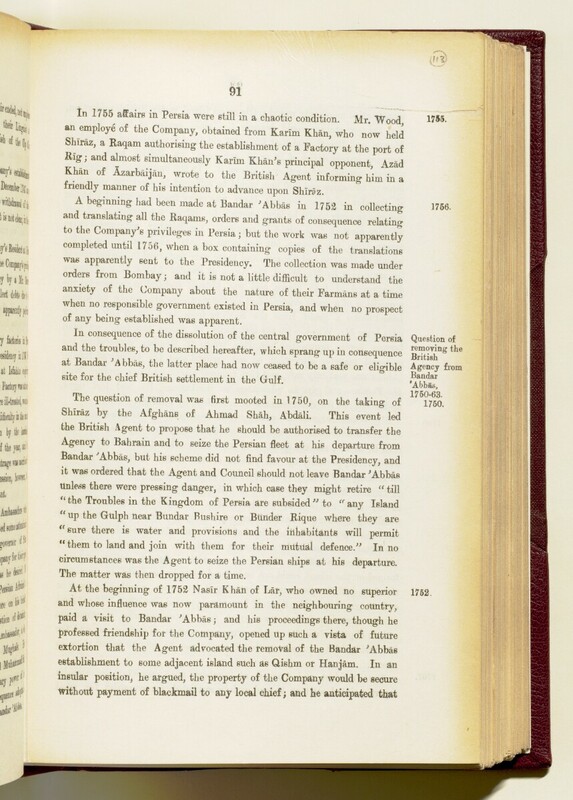 Footnotes appear occasionally at the bottom of the page to provide further details and references. Volume I, Part IA: The sequence begins on the first folio with text, on number 1, and ends on the last folio with text, on number 456. Total number of folios: 456. Total number of folios including covers and flysheets: 460. Volume I, Part IB: The sequence begins on the first folio with text, on number 457, and ends on the last folio with text, on number 878. It should be noted that folio 488 is followed by folio 488A. Total number of folios: 423. Total number of folios including covers and flysheets: 427.